You guys! I’m really excited to share this with you- I have brand new craft workshops online at Creativebug.com as of NOW! Here’s the thing, I’m super proud of my craft workshops. But, I’m also humbled by the company I keep there. Some of the other crafters who have recorded workshops for Creativebug include Debbie Stoller, Heather Ross, Cal Patch, Jill Draper, Christine Schmidt, Jenny Doh and Liesl Gibson to name a few. A FEW! I would really love it if you would check out my workshops and the fun “Meet Rad” bio clip. 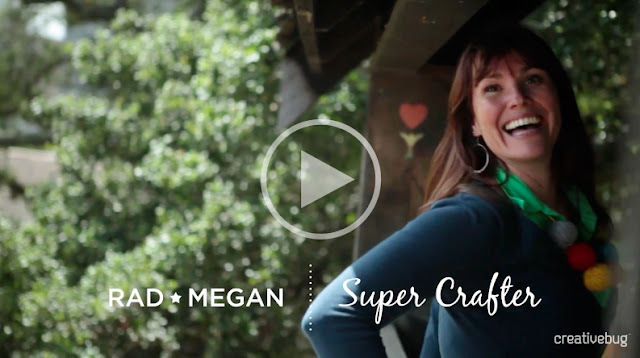 I love sharing my crafty skills and experiences and being able to do it in a video format is an awesome way for me to reach more of you out there in the great wide world. We aim to be your go-to source for online art and craft instruction. We’ve gathered some of the most inspiring designers and crafters to bring video workshops right to your screen. Whether you’re an accomplished artist or just getting acquainted with a glue gun, our workshops provide project ideas, expert guidance and a healthy dose of creative inspiration. Fancy learning how to crochet at midnight? Have a hankering to paint in your pajamas? Once you become a member, you’ll have unlimited access to all of our workshops. We’ll keep a library of your favorites and even remember where you left off if you want to continue later. Each workshop is broken down into video segments so you can skip ahead or watch a video again and again until you master a technique. We also strive to make a difference by donating 5% of all subscription revenues to non-profit art organizations. To keep up with Creativebug, and be alerted when more radmegan workshops are released, Follow Creativebug on Twitter, Like them on Facebook, Follow them on Pinterest, and of course, subscribe to Creativebug to start learning and creating!! very useful information , i’ll share my friend with about.